This week’s European Commission reflection paper is the latest document to ponder a distinction between EU and euro-area budgets. But do we need to split the two, and what would each budget be used for? In this post, I present an analytical framework for assessing this ultimately political question. This post was published on Bruegel. The European Commission has just published its reflection paper on the future of the EU budget. It touches on many topics, but at its heart the paper is agonising over one political question: Should there be a euro-area budget distinct from the overall EU budget? And if so, what kind of interplay will there be between the two? Do really we need both or could all functions that a euro-area budget should fulfil be assigned to the EU level? This question is all the more important at the moment because the EU is in the process of losing one of its largest members. The EU budget will shrink as a consequence. Brexit will not only mean a smaller EU budget. It will also mean that the euro area will account for 85% of EU GDP and 76% of the EU’s population. Is it still really necessary to create a supplementary euro area budget? The Commission document offers a number of thoughts on the matter (p22). First, it proposes “technical support” for structural reforms, which may be open to all member states but perhaps seems more necessary in euro-area countries. The Commission intends to assess this matter. Second, it suggests that EU budgetary payouts could be linked to “upholding EU core values”. Third, it suggests that the EU budget could play a role in providing some of the stabilisation function that the Commission reflection paper on the future of monetary union is proposing for the euro area. One can clearly see that the debate is wide open inside the Commission as to whether there even needs to be a separate euro-area budget or whether everything can be subsumed under the EU budget. 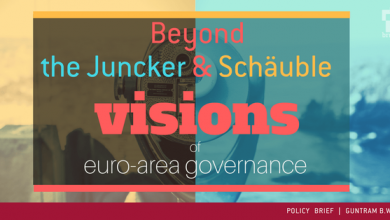 The debate is open because different visions exist on the future of the EU and the euro area. And the key difference between the competing visions is about whether the EU or the euro area is the core political unity. In this post, I propose an analytical framework to think about this question. I start from the three functions of public finance as discussed in Richard Musgrave (1939): allocation, re-distribution and stabilisation. I will conclude by discussing a number of political dimensions of this question. Allocation describes the role of public finance in allocating tax resources to public goods that would not or could not easily be provided by private actors. One typically thinks of the services provided by the public sector, of defence, foreign policy, of public infrastructure, of networks, environmental regulation and the like. For most of European-level public goods, I would primarily think of the EU as being the appropriate entity to provide those goods. For example, when I think of European networks, I fail to see what a euro-area network for gas or telecommunications could look like distinct from an EU network. The externalities arising play at the EU level or even at the global level so EU-level provisioning makes sense. There is one possible exception: financial stability. While financial stability is a global and an EU-wide public good, the euro area creates its own specific financial stability challenges that are intrinsically connected with the Euro. For example, the ECB provides liquidity to all banks in the euro area – so a euro area-level deposit insurance would usefully complement the banking union and in certain circumstances reduce the exposure of the ECB to possible bank runs. Therefore, I conclude that building and funding the adequate euro-area financial stability institutions is sensible. Redistribution refers to the role of the budget in redistributing tax resources from people with greater ability to pay to people that may be in need of additional resources. Redistribution is a political choice and different countries and societies have chosen very different levels of redistribution. The German philosopher Peter Sloterdijk recently expressed the opinion that solidarity systems can so far only be sustained in national frameworks. And indeed, modern solidarity systems have been built around the nation state – replacing them with European ones will be an uphill struggle. Possibly, however, the European level could complement the national solidarity systems. This then raises the question of which “European level”. Is there a dimension inherent to the EU or inherent to the euro area that would speak in favour of exercising redistribution at that level? The EU has so far related redistributive elements to the creation and the deepening of the single market. It is well known that the removal of trade barriers can create losers and winners. The single market goes far beyond the removal of trade barriers, establishing also the free movement of labour, capital and services on top of the free movement of goods. This can lead to significant tensions in both countries with higher GDP levels and countries with lower GDP levels. The EU’s redistributive system focuses on providing support so that economies can catch up and economies can cope with the pressures of the single market. And while the effectiveness of that system can be discussed, it is clearly linked to the EU. But does the euro have additional social implications? The European Commission has framed its discussion of the social pillar around monetary union but does not provide a justification for that choice. The euro is, of course, a means to establish greater market integration by removing exchange rate uncertainty. And if one accepts that the single market requires a redistributive element, then it would only be logical to also require an additional redistributive element in the deeper single market that monetary union is supposed to constitute. However, the evidence that the euro has created much deeper labour, service or goods integration as compared to the EU is not very strong. Effects on trade are more modest than was hoped for. We are also not aware that migration numbers within the euro area are superior to migration numbers in the EU as a whole, or that the creation of the Euro has led to additional migration. Also, to my knowledge, the notion that the Euro as such has created agglomeration effects is not supported by any empirical evidence. There is, however, one redistributive question related to the Euro: the euro area remains a highly imbalanced currency area. Not only are income levels very different but there are different varieties of capitalism. The mechanisms through which euro-area economies adjust to shocks are also different. Taken together, this has all meant that market forces to correct imbalances are either ineffective or slow. For example, without a nominal exchange rate, real adjustment happens only very slowly and gradually. And current account surpluses remain elevated for extended periods of time without visible adjustment. Redistribution could be a way to compensate for such lasting imbalances. However, I would consider this as undesirable. The reasons why such redistribution is undesirable are political and economic. From a political point of view, long-lasting transfers in the monetary union are unsustainable for the countries providing the payments. From an economic point of view, long-lasting transfers only cement and sustain the very same imbalances. In my view, it would be preferable to address these imbalances more proactively instead. Stabilisation policy is the ability of the state to borrow in the markets in recessionary times at low costs and spend so as to increase aggregate demand when the private sector is retrenching. Governments can issue large amounts of debt risk-free if they have unlimited access to the printing press. Any risk to the investor is then only related to the exchange rate and inflation but not to the nominal value of the investment. Monetary union has profoundly changed that relation. It has removed the exchange rate instrument and the ability to use monetary policy to avoid nominal default. As a result, national governments have become more constrained in their use of fiscal policy as a stabilisation tool. The euro area has addressed this issue with three tools so far. First, it has prescribed that governments discipline their fiscal policy in good times so as to create sufficient fiscal space in bad times. The reality is that the set of rules to achieve this has largely failed to deliver. Second, it has created the ESM. The ESM has been successful in increasing the ability of governments to continue to borrow at low rates. But it has been deeply unpopular due to the conditions attached to it and the guarantee given by stronger countries. Third, it has created the OMT programme which allows governments to significantly increase their borrowing ability as long as there is political support by all other euro-area member states. It is thus clear that the euro area has created a set of problems regarding stabilisation policy that is distinct from the EU budget. In a recent post, I have explored a number of options for how a euro area stabilisation function could be structured, showing that this won’t be easy. EU countries outside of the euro area are not confronted with the same stabilisation policy issue. Of the three functions of government, the clearest case for a euro area budget distinct from an EU budget is in the area of stabilisation policy. As regards the provision of public goods, I can only really make the case for financial stability to have a specific euro-area dimension. And when it comes to redistribution, the euro area dimension is mostly related to sustained imbalances. The latter, however, have far-reaching negative consequences and I would therefore argue that the imbalances themselves need to be addressed, rather than taken as justification for euro-area spending. All in all, the core of the matter remains political. Public finance is at the very heart of politics. Stabilisation policy is not just a neutral macroeconomic tool – it has distributional consequences. Public goods are ultimately defined by political entities as they represent political choices. The real question is therefore whether further political integration steps, if they happen at all, shall happen at the EU or at the euro area level or perhaps even at smaller sub-sets of the EU. The Bratislava summit decided to preserve the unity of the EU 27. But recent developments may change that consensus and the agonising on display in the Commission document is a reflection of that fact.